Carmen Bissin, RN, of BrightStar Care of San Luis Obispo, takes top honors at National Owner’s Conference for a strategy on how to recruit and retain the highest standard of employee. Everyone in the BrightStar family is super proud of the hard work Carmen put into the project. 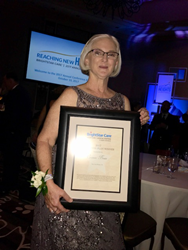 Carmen Bissin, Director of Nursing at BrightStar Care of San Luis Obispo, a home care agency that also provides medical staffing solutions, recently won first place at the National Owner’s Conference for her submission of a branch leadership action plan. The winning plan Bissin put together was a strategy on how to recruit and retain the highest standard of employee for the BrightStar Care office located in San Luis Obispo, independently owned and operated by SLO native resident Mechell Vieira. As with most BrightStar offices, the quality of the caregiver is key to the high level of service BrightStar Care promises its families. Bissin noted that many caregivers actually needed more time to complete the orientation process, and also that an orientation that includes all of the members of the management team makes for a more secure employee. Her suggestions were then tracked to verify the length of time an employee was working at BrightStar was actually improving. BrightStar Care of San Luis Obispo is accredited by the Joint Commission, which is recognized nationwide as a symbol of quality that reflects an organization’s commitment to meeting certain performance standards. Because of its accreditation, BrightStar Care of San Luis Obispo is required to maintain strict standards of hiring and retention. For more information about careers at BrightStar Care of San Luis Obispo, please visit https://www.brightstarcare.com/san-luis-obispo/careers. BrightStar Care of San Luis Obispo provides quality home care, caregivers and medical staffing solutions to families and businesses in the San Luis Obispo County area. Its home care agency services include Alzheimer’s/Dementia care, companion care, personal care, child care and transportation services. For more information, call (805) 322-3698, or visit http://www.brightstarcare.com/san-luis-obispo.